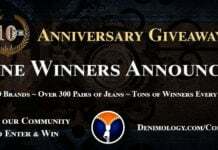 This week Tobi.com are giving you the opportunity to win a pair of AG Jeans. AG pride themselves on offering the most beautiful and true vintage washes in impeccable fits. They look to vintage jeans for inspiration, as each jean really does tell a story, and no two are alike. The AG brand is dedicated to the continued development of the brand and a commitment to the Made in the USA label. The winner of this giveaway gets to choose any AG denim from Tobi for up to a $255 value. Please note that by entering this competition you are agreeing to receive email newsletters from both Denimology and Tobi. Only one entry per email address will be accepted and the closing date for entries is December 31st, 2009. Oh I soooo hope I win! A while back, both my husband & I lost our jobs &, as a result, everything we owned. We’ve been living in a motel & neither of us have any decent clothes. So, for fun (and as a form of self-torture) I go to clothing stores, look around, try on clothes, & fantasize about what I’m gonna buy when I win the lottery. Anyway, one day I tried on some AG Jeans & fell in love!! I’m built really odd (kind of straight up & down & long-legged) & have a really hard time finding jeans that fit the way I like & are also long enough for me so, when I tried those on & saw the way they fit me, I was hooked. So, thank you so much for running this giveaway since this is probably the only wa I’ll ever get a chance to possibly get some of them (unless that lotto thing happens pretty soon). I’d also like to wish everyone a happy, healthy, & blessed holiday season & a prosperous new year!